Two posts in one week?! Yes, this is really happening folks, and there's more to come. Today marks my one year anniversary as a food blogger, so I figured why not celebrate with some extra special new recipes this week! 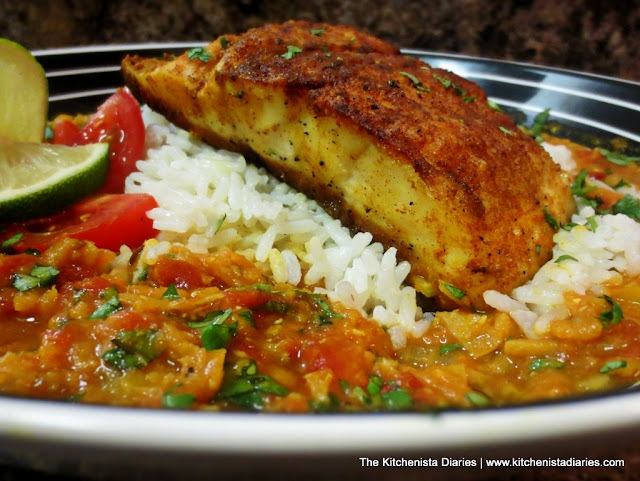 I thought this Curry Snapper & Red Lentils dish was particularly fun and festive. Besides the vivid colors, curry spices are literally a party going on in your mouth...which seemed completely appropriate for this occasion! When I set out to start The Kitchenista Diaries, my goal was to create flavorful, healthy, gourmet style dishes on a budget. Sunday dinners are my favorite way to branch out with recipes that are a bit more special than regular weekday meals. This dish is a great example of how I often make a small splurge on a nice piece of fish or meat and visit my farmer's market for organic fresh produce. The rest of the dish is supplemented with everyday pantry items. In doing that, it's really easy to make an affordable, restaurant quality at home. 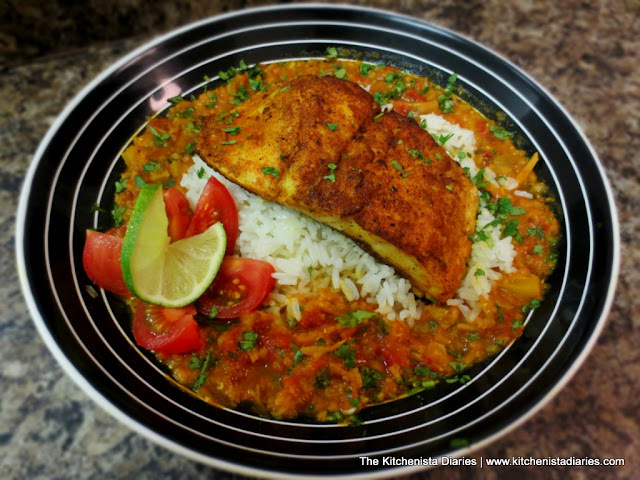 With snapper on sale for $9/lb, leftover veggies in the fridge, and a portion of red lentils at a measly $1, this dish easily came in well under $20 for four servings. Y'all know I love my curries and I'm continuing to find new ways to work these intoxicating flavors into new dishes. My experiment for Sunday Dinner this weekend utilized red lentils. Lentils and I have a love/hate relationship. I love that they're relatively good for you, but hate when I have a pot simmering for what seems like forever and end up with boring brown mush or worse, undercooked lentils. Last time I went to the farmer's market, I stopped by one of the organic shops and the owner recommended trying split red (or orange) lentils. He said they cook much faster, are easy to digest, and take on seasonings really well. This sounded intriguing enough that I decided it was worth giving lentils another chance. As soon as I got home that day I tweeted about my farmer's market finds. My followers recommended making an Indian curry lentil dish, otherwise known as "dal." That was the first thing that came to mind as I brainstormed all weekend how to stretch the food I had on hand. I did have some fresh snapper but knew the rest of the dish was going to have to come from pantry items and leftover veggies to stay within my budget, and that ended up being really easy to do. I was even able to work in a small pot of coconut Jasmine rice on the side. While my version of dal isn't traditional, I figured out a way to make things my own and I have to say I'm quite happy with the way this one turned out! Consider me converted...red lentils are an inexpensive and nutritious add to your pantry and I'm sure there are a ton of ways I'll be able to make use of them. You need a good, heavy bottomed skillet. I prefer cast iron or enameled cast iron, but stainless steel works well too. Pat your fish dry prior to seasoning and searing. Wet fish dropped in a hot skillet just leads to steamed fish (for this reason, thawed frozen fish can be tricky.) Not to mention, water coming into contact with hot oil is a bad idea. The skillet needs to be hot. Use the right size burner for the diameter of your pan. Because cast iron retains heat so well, you will likely just need to set your stove to medium to reach a high searing temperature. For other skillets, use the appropriate heat setting that works for your cookware. Use an oil with a high smoke point. Grape seed oil and coconut oil can be great, healthy choices. Extra virgin olive oil has a low smoke point, and isn't recommended for the high heat needed in this application. Don't move the fish after you put it down in the skillet. It will stick to the pan and create a mess. Let it be! After a few minutes the surface of the fish will crisp and sear, and it will naturally release contact w/ the skillet. Then you can easily flip or remove it. Watch for changes in color and texture to monitor doneness. You can watch as the color along the sides of the fish turn opaque as it cooks; the fish may also become visibly flaky. When in doubt, a thermometer can be a great tool to measure internal temperature. For especially thick fillets, it may be appropriate to sear each side and finish roasting in the oven to avoid overcooking the exterior. Some fish, like salmon and tuna, are best when seared briefly for a rare to medium finish, while other types of fish should be cooked all the way through. Most recipes will indicate these specifics, and with practice and observation, you'll get to know what to expect with your favorite types of fish. 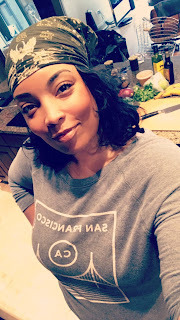 Without further ado, let's get into this dish...Happy Birthday to The Kitchenista Diaries! Servings: 2 (8 oz. fish portions) or 4 (4 oz. fish portions); Lentils serve 4. The prep work is pretty basic for this one. Chop up some garlic and cilantro, slice your ginger (leave that skin on), dice the onion and bell pepper, prepare your spice blend. You know what you'll never find in my recipes? A generic mention of store-bought "curry powder" in the list of ingredients. Step up your pantry game and keep real spices in stock. Seriously, it takes 5 minutes to make your own curry powder so why rely on mystery spice blends in the back of your cupboard that are probably a couple years old? To toast cumin and fennel seeds: Place a single layer of seeds in a dry skillet over medium heat, shaking frequently, approximately 5 minutes until fragrant. Watch for the color of the cumin seeds to darken and remove from heat. Toasted seeds should be used the same day. You may be surprised that I didn't add any hot peppers or cayenne in the mix for this dish. To be honest, I totally forgot, and didn't think the finished dish was "missing" anything when I was done. It was actually refreshing not to eat something spicy and just enjoy the fresh flavors. But you better believe I added some jalapenos with my leftovers the next day! You'll want to get your lentils going first. Rinse them off well in a fine mesh strainer until the water runs clear and pick out any debris. This is the part I was nervous about. I've had really bland lentils before so I was skeptical about cooking these in water instead of some kind of stock. You really don't need the stock as it turns out, water is just fine and the lentils will soak up all that goodness from the tomatoes and curry spices later on. In your medium pot, bring the lentils and 4 c. water to boil, then reduce heat and simmer on low for 20 minutes or until lentils have softened and started to break down. You'll see some yucky foam rise to the top while the lentils cook - don't be scared, just skim that off. I don't know if it's true that it'll give you gas but who really wants to take chances on that? While the lentils cook, cut your snapper into 4 oz portions if you're feeding 4 people...or bigger pieces if you're greedy. I won't judge you, snapper is pretty damn delicious. Pat the snapper dry, season with a good pinch of kosher salt and rub in a little bit of the curry spices. Don't skip the step in making sure the fish is dry, that'll be really important in getting a good sear later on. You should get the main pot or skillet going about ten minutes into starting the lentils, if you're multi-tasking. If you're not pressed for time, no harm in doing everything consecutively either. Over medium heat, in your large pot (or as you can see, I used a deep dish skillet) add a couple tablespoons of oil and cook the onions for a few minutes until softened. I let them start to get a little golden brown around the edges to build flavor. Season with a pinch of salt. After onions soften, add the ginger, garlic and lemongrass. I didn't plan to use lemongrass when I started cooking, which you may have noticed in the pics. But once I had that ginger and garlic going it dawned on me that lemongrass would actually work really well with these flavors. At this point it didn't really matter whether I was going for Indian or Thai, all I knew is that it was smelling awesome. No worries if you don't have any. It adds some excellent citrus notes that aren't replicated exactly by fresh lemon or lime juice, but you could certainly use lemon zest in a pinch. Add the toasted cumin and fennel seeds, as well as the other curry spices. Cooking the spices for a minute in the hot oil will help the spices bloom and make a great flavor base for the lentils. Stir in the diced bell peppers and saute those for another minute. Season with a pinch of salt. Transfer the cooked lentils and any remaining cooking liquid to the skillet and stir to incorporate the onions, peppers, aromatics and seasonings. Allow this to simmer for 10 minutes until slightly reduced. Check and adjust your seasonings if necessary. This is a good time to start cooking your snapper so that everything is ready at once. If you skipped over the tips on searing fish above, you might want to scroll back up and review that. Ready? Let's sear some red snapper. To know if your skillet is hot enough, drop a tiny bit of water into the skillet. If it sits in the skillet for a second then evaporates, the skillet isn't hot enough. If the water disperses into droplets that dance across the surface of the skillet, it's ready! Now you can add the oil, just enough to coat the bottom of your skillet. When you lay the fish in the hot skillet, place the end of the fish near you into the pan first, letting the fish fall in the direction towards the stove. This helps to prevent hot oil from splashing towards you. Allow the snapper to sear 3-4 minutes depending on thickness of the fillet. Once seared, the skin will be extremely crispy and it should be easy to flip the fillet over using your spatula or tongs. Continue searing the other side for another couple minutes until the fish has cooked through. For a larger piece of fish, tilt the skillet and use a spoon in a quick circular motion to baste the fish with hot oil. A pat of butter melted into your skillet at this point is an awesome way to get a little extra flavor in there too. Basting the fish helps it to cook more evenly and allows you to concentrate on browning any spots that didn't quite get seared as well. Set the cooked fish aside and add the chopped tomatoes to the cooked curried lentils. Check seasoning for the last time, adjusting with salt and pepper if needed. Stir in half of the cilantro and the juice of a lime. Inhale the delicious aromas. Ladle a good portion of lentils into your bowl, mound a little coconut rice in the center, and lay a piece of seared fish on top. Garnish as you'd like with extra cilantro, fresh tomatoes and lime slices. You're ready to dive in now. Enjoy! These fish tacos you're about to make after reading this recipe are amazing. I promise you. But do you know what's even more amazing? 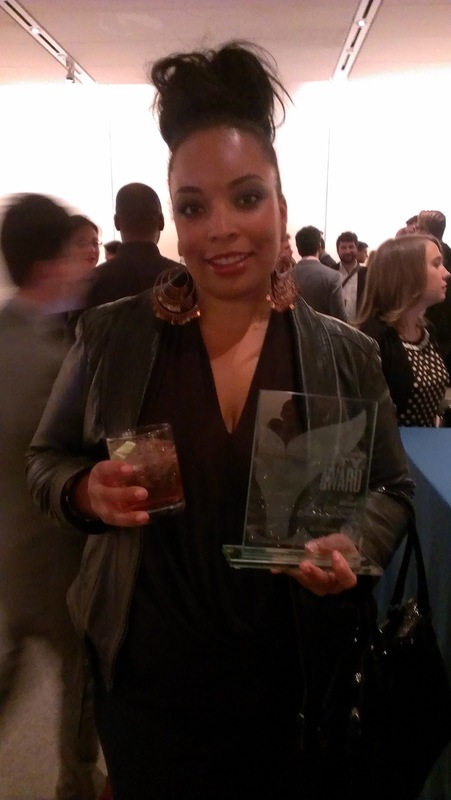 I won a Shorty Award!!! Sometimes you have to forget humility and bask in your own awesomeness. I'm having one of those weeks. 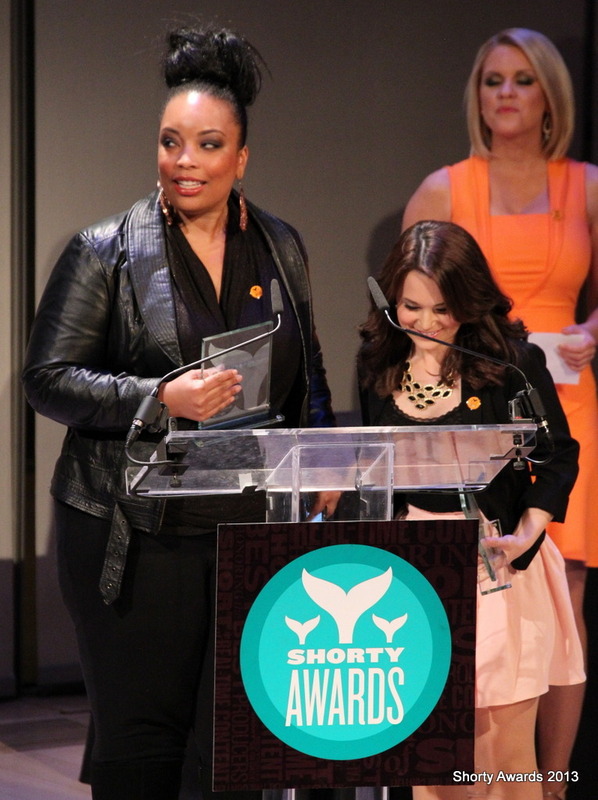 On Monday night I traveled up to New York City to attend the 5th Annual Shorty Awards in Times Square. Halfway through the ceremony, the #Food category was announced. Mind you, I've maintained a positive mentality throughout the campaign over the last few months, determined to give it my all and win this thing. Still, there is nothing more nerve wracking than those last few seconds leading up to the moment you find out the results. When I heard "The Kitchenista" called, a tie with Rosanna Pansino of "Nerdy Nummies," I wasn't prepared for the rush of emotions that hit me. Forgot about my stage fright and everything. Forgot what I was supposed to say. Damn near forgot my own name. I was just so incredibly surprised and amazed to find myself standing on a stage in front of all of those talented people, accepting an award for doing what I love. 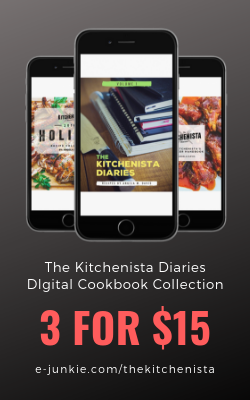 The Kitchenista Diaries turns 1 this week! 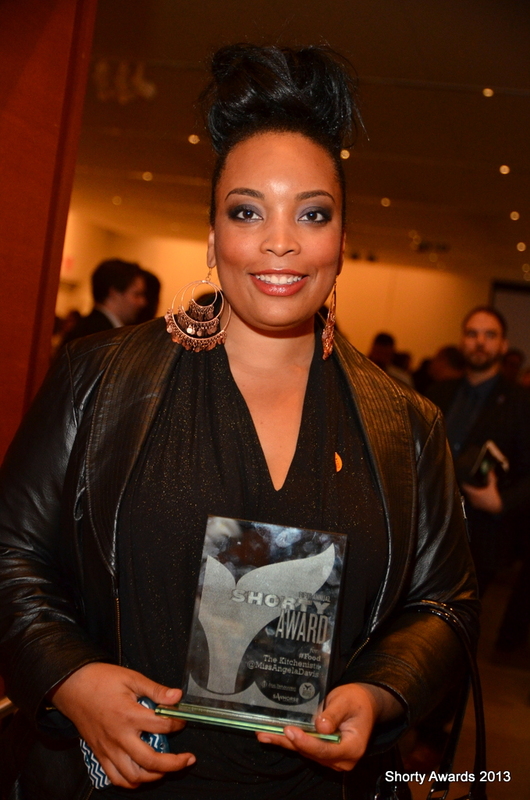 I'm still a rookie at this blogging thing, so to end my first year on such a high note at the Shorty Awards? Let's just say the bar just got set even higher for the coming year. To everybody who voted in the Shorty Awards and helped to promote my campaign, thank you. To all of my readers and subscribers, thank you for supporting me, encouraging me and inspiring me to explore my passion for cooking! Okay, okay...on to the tacos! 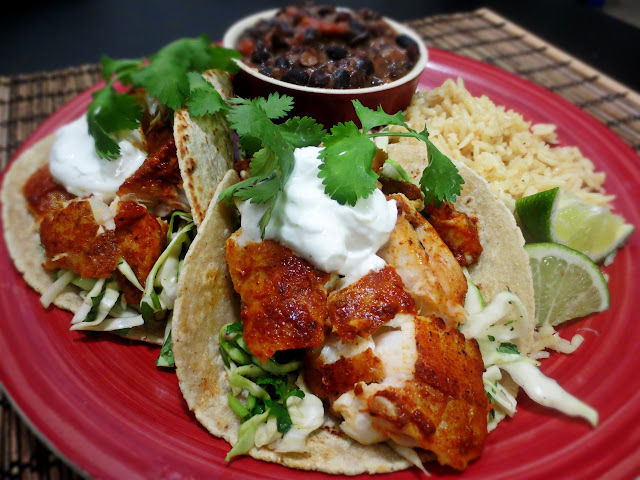 Guajillo fish tacos are decidedly simple in execution but the flavor is out of this world. I've been playing around with dried Mexican chilies over the past few weeks, using them in everything from pork roast to bbq sauce. Fish tacos seemed like a great reason to continue my experiment, especially after watching Patricia Jinich whip up some great looking Adobo Fish Tacos on the Create channel. I headed over to the Latino supermarket where I knew they'd have dried chilies in stock, and sure enough I found bags full of Ancho chilies and Guajillo chilies. I went with Guajillo for this recipe for its deep fruity flavor, with a couple Chipotle peppers added for spicy smokiness. You can easily substitute your favorite pepper here. The recipe is a twist on my basic fish tacos recipe, where a soft corn tortilla, crunchy slaw and Greek yogurt play supporting roles. Step away from the boxed taco kits and salty seasoning packets folks. Real flavor lies in real food, so make these healthy and delicious Guajillo Fish Tacos for your next #TacoTuesday...while you're at it, cook up some brown rice & beans too! Using a knife or kitchen shears, snip off the chili stem ends, remove core and shake out the seeds. In a dry heavy skillet over medium heat, toast chili peppers for 20-30 seconds per side, being careful not to let them blacken. Burning the peppers yields a bitter taste, so remove as soon as they are fragrant and start to puff up a bit. Transfer toasted chilies to a small dish and cover with boiling hot water. If necessary, place a bowl on top to ensure peppers are completely submerged. Guajillo chili peppers have a tougher skin than most, so allow them to steep approximately 15 minutes or until softened. Do not discard the liquid. In a food processor or blender, combine the softened Guajillo peppers, chipotle peppers, juice and zest of one lime and orange, garlic cloves, a couple tablespoons of olive oil, cumin, oregano, coriander, smoked paprika and cinnamon. Add a good couple pinches of salt and plenty of cracked black pepper. Puree until smooth, adding some of the liquid used to steep the peppers if necessary; I used about 1/4 cup. You’re looking for a spreadable consistency similar to thick mustard. Season the paste with additional salt and pepper if necessary. Press the chili paste through a fine mesh strainer to remove any seeds or large pieces of pepper skin. If you don't use all of this for one recipe, keep any leftovers in a small jar, covered with a thin layer of olive oil. It’ll keep for a few weeks. I used my leftover chili paste as a marinade for roast pork! Pat the fish dry and season each side of the filet with a pinch of kosher salt. Coat the fish fillets with a generous amount of Guajillo chili paste on each side. Allow to marinate at least 15 minutes or overnight. While the fish marinates, prepare the slaw by combining shredded cabbage, cilantro, juice and zest of half a lime, apple cider vinegar and salt and pepper to taste. Drizzle just enough honey to balance any bitterness of the cabbage; approximately two teaspoons. To make a quick sour cream substitute, mix the juice of about 1/2 lime into 1/2 cup of drained Greek yogurt. In heavy skillet over medium high heat, add two tablespoons of oil. Carefully place fish into the skillet and sear on one side for a few minutes. You'll know the fish is seared when it can easily be moved by the spatula. If you try to move it too soon you'll run into problems with it sticking to the pan. 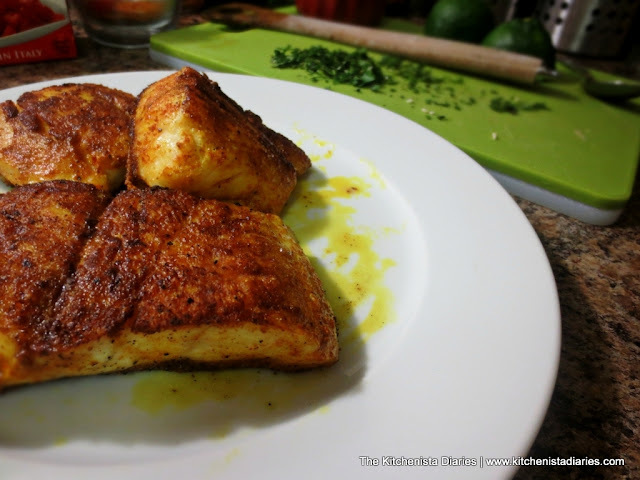 Tilapia cooks very quickly so depending on the thickness of the filets this should take no more than a few minutes per side. It's going to smell ridiculous right now and you'll be tempted to eat it straight from the skillet. Wait for the taco. I brushed some extra chili paste on my fish prior to serving, because...why not?! To serve, spoon some of the crunchy cilantro slaw into a warm tortilla, break up some big chunks of fish and put that on top, then a dollop of yogurt. Prepare to be blown away. Now that's how you do #TacoTuesday!